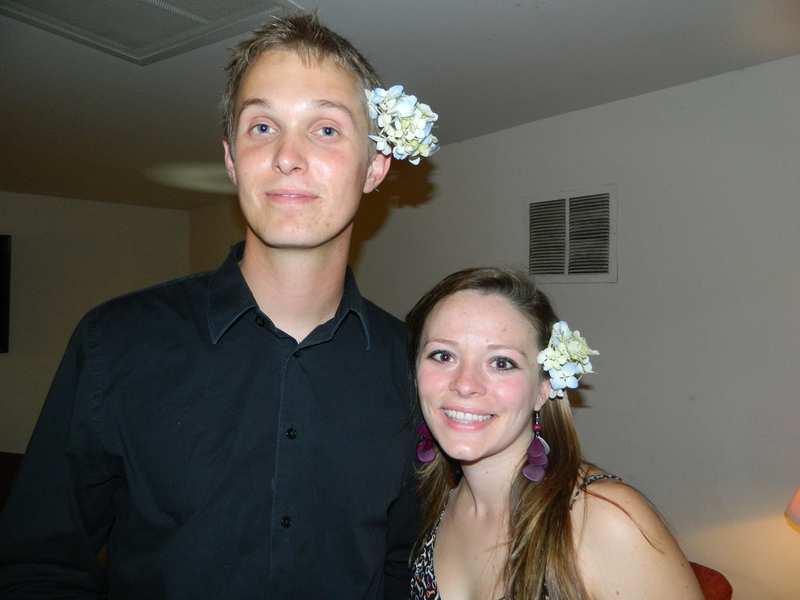 Jared and Heather are one of our more recent couples. They married July 1st at the Jazz Hall of Fame in Tulsa, OK. We don’t yet have their pictures, but we’re told we may sooner than later! 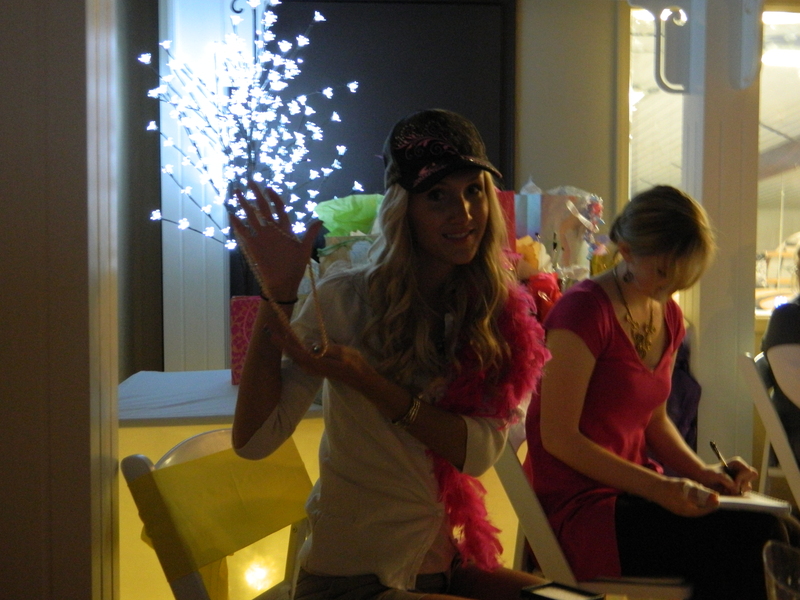 Heather is a photographer who has her own studio, and Jared owns his own construction company. They’re a busy couple that didn’t have much time for planning, but wanted everything to be just right. 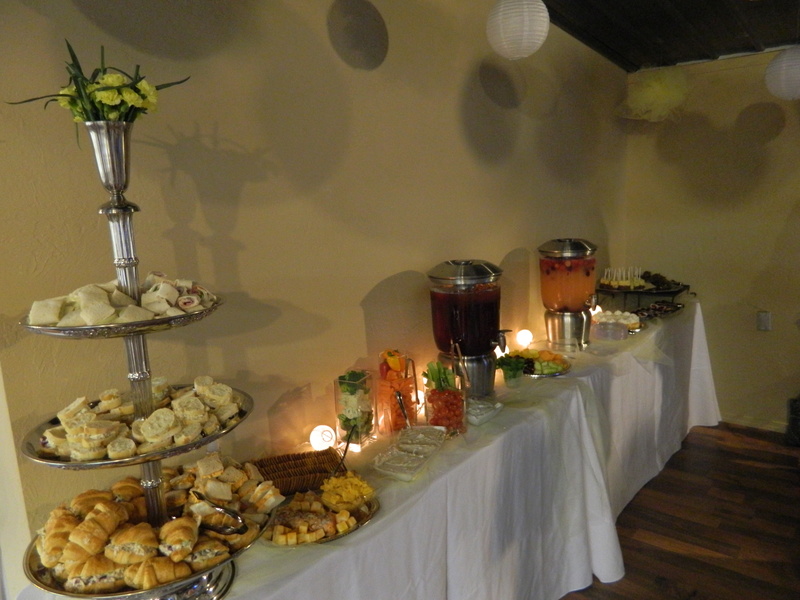 Their shower was held at the University Club Tower in downtown Tulsa on a warm summer day. The original plan was to have the shower in the evening on the fantastic patio and yard of the Tower, but it was so incredibly windy our plans changed 2 hours before to have it inside! My inspiration for this shower was the that the groom was my brother. 😉 So basically, I did what I wanted cause he had to let me! Haha okay no so much… But it was much more personal than most events I do. The budget was $500. He loved the hydrangeas so much he wore one around for a while! This is Jared with his bride-to-be, Heather. I went with green silk cloths to keep it a bit dressier, as the University Club Tower is a nicer place. But I had to have some butterflies there! My brother and I were quite the bug collectors, butterflies and fireflies were our favorites, so that was a must. 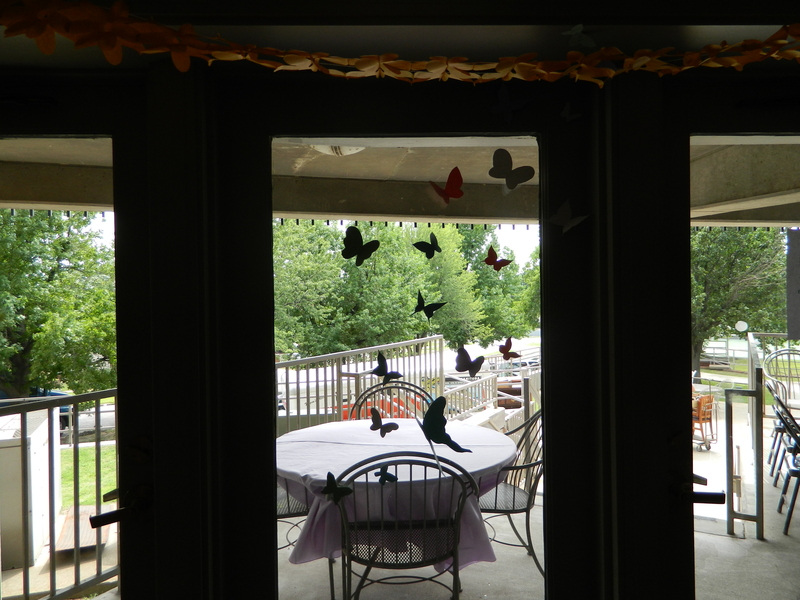 The butterflies on the windows, hand cut by my Mother and I. 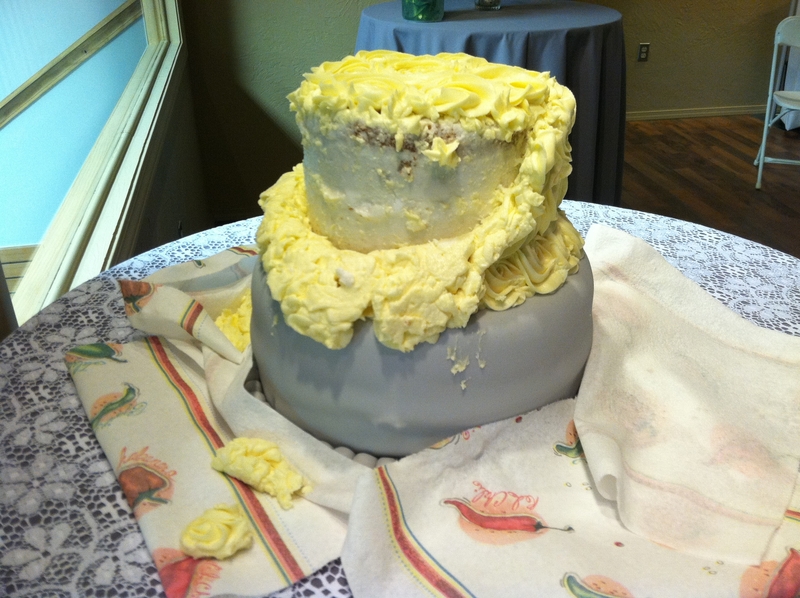 They have the best flavored wedding cakes you’ll ever eat (orange pineapple, anyone? ), and they are by far the most impressive on design as they pretty much refuse to use fondant, so the cakes stay delicious. What does that mean? 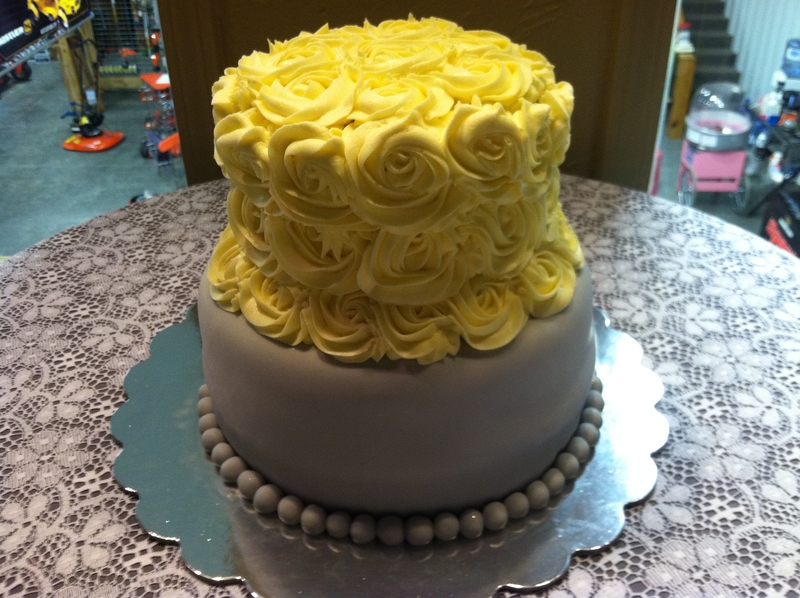 Butter cream art, all by hand! No laser cutting fondant machines for these pros. So how could I not get the most lovingly created cake from thisoutstanding bakery for my brother and his new wife? Especially because they have amazing gluten free cake, so that was a must for my gluten intolerant soon to be sister in-law. The gluten free cake and the cake balls. Ignore the terrible plastic cloth. Ugh! That was because of a horrible mishap with the intended linen. 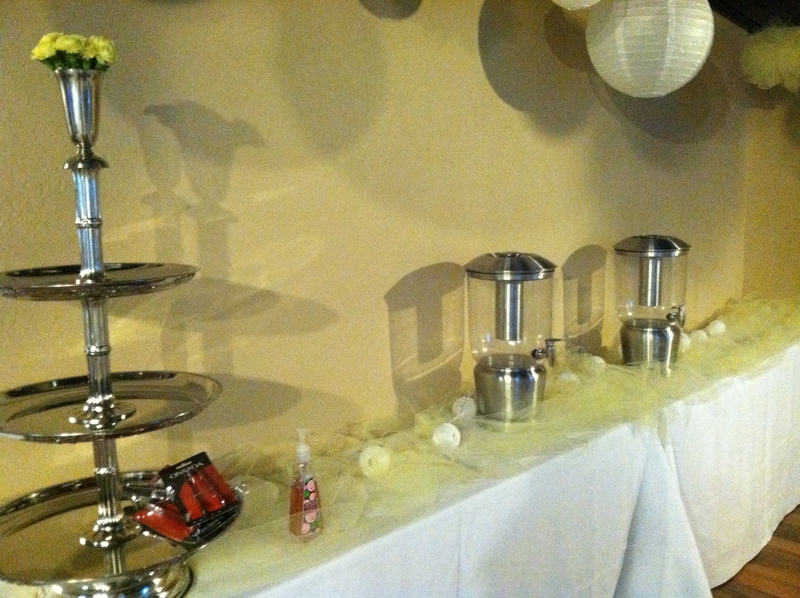 For the favors, we did tubes with small thank you cards, and filled them with jelly beans and skittles, their favorite candies. The favors sat in a basket by the door for guests to grab on their way out. 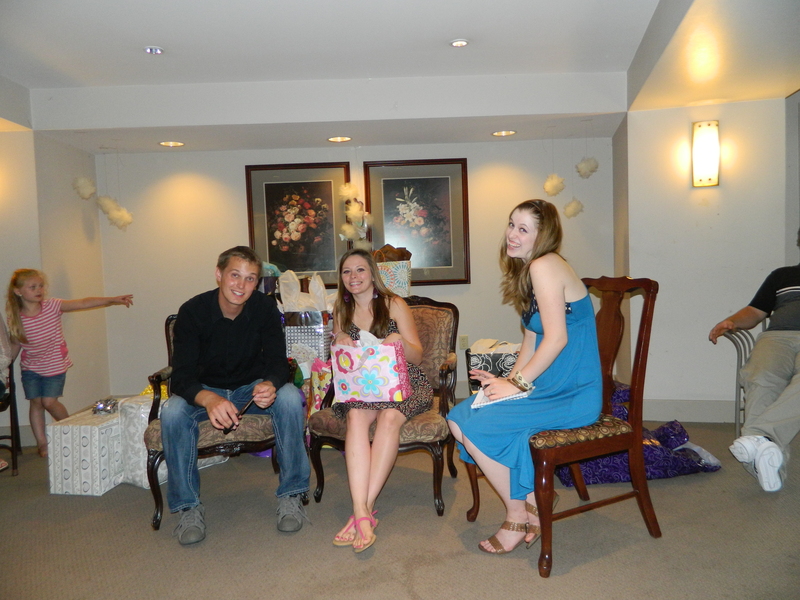 They got a lot of great gifts and were excited to see all the family there. It turned out to be a great shower, and everyone was willing to lend a helping hand. So what did you think fo this glimpse into my personal life? What did you like about the shower? Ashley was a May bride. This is her personal (or lingerie) shower. It was actually held in The Loft, so you get to see our work space! We did have the lighting low, so the pictures aren’t of the absolute best quality. I’ll show you what my ideas and inspiration was, what the final products were, and what she thought of her shower. My budget was $800. I came in well under! 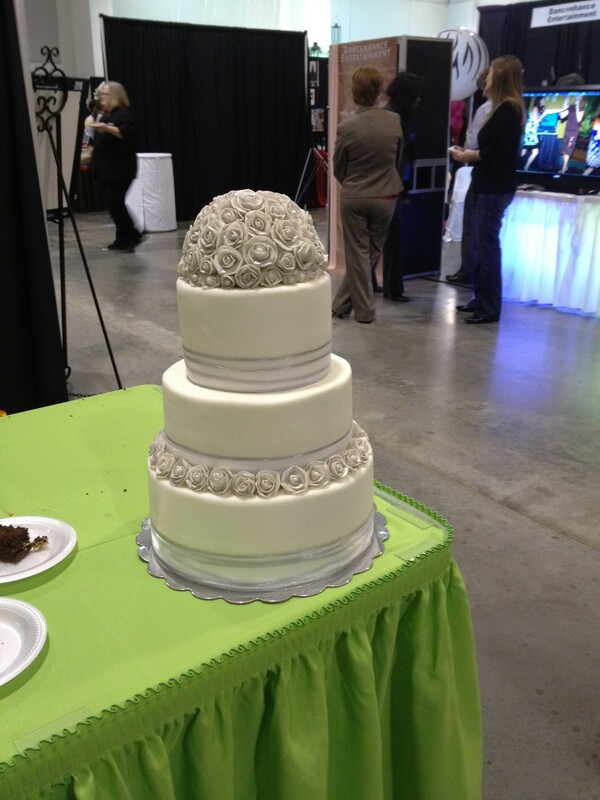 I loved the rosette details on this cake I had seen at a Bridal Show when I first started working on the shower. 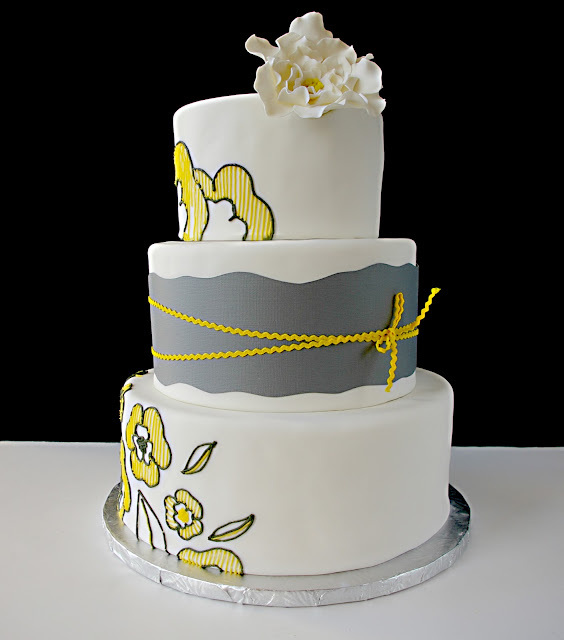 I decided I wanted to use gray/silver from this cake. I really wanted to use daffodils. They just didn’t quite go, so I ultimately went with carnations. I loved the clean white of the tables in this photo, as well. So I decided I would use white overlays and chairs to keep it crisp and contemporary. 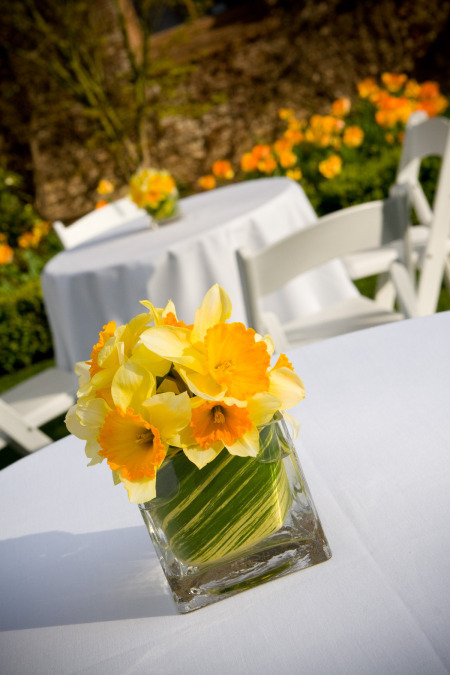 Her favorite flower is a daffodil, and I really wanted to use them for centerpieces. I looked around and discussed it with the florist I used, but we ultimately decided carnations would be our best bet for the style. I had been wanting to make a chandelier for a while, so I jumped on it and went and got a lot of paper doilies to make a Martha Stewart style one. Well, my doilies didn’t want to be a chandelier. So I snatched some tissue paper from Angela (she was hand making some invitations, for a birthday party, that she used tissue paper for that week) and I did a test run. Voila! Works perfectly. So I go get my paper in the colors I wanted, some ribbon, and a board to cut into a frame. 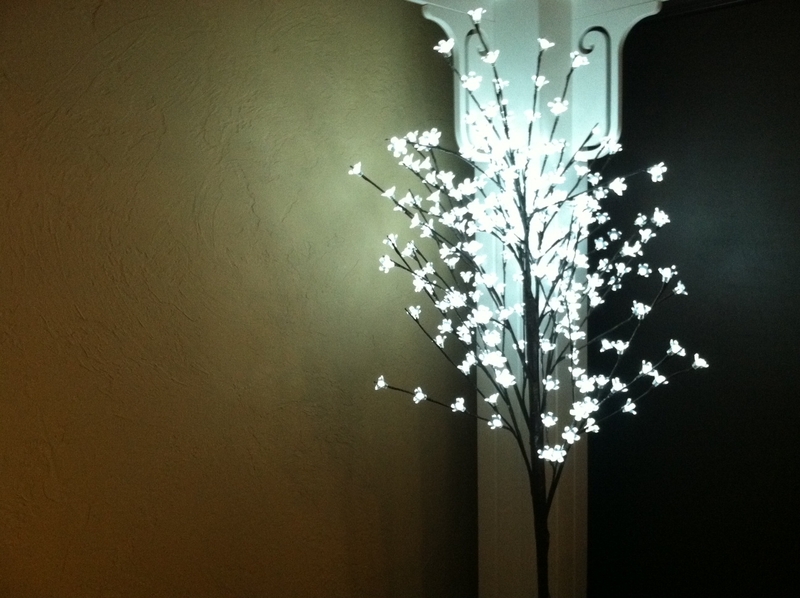 The chandelier hanging in the entryway, completed. It took a while to choose the layout for the room, where my touches of yellow would be, and how exactly I would use my color scheme. For the layout, I scattered sitting height cocktail tables around the room, with conference tables for serving to save space. 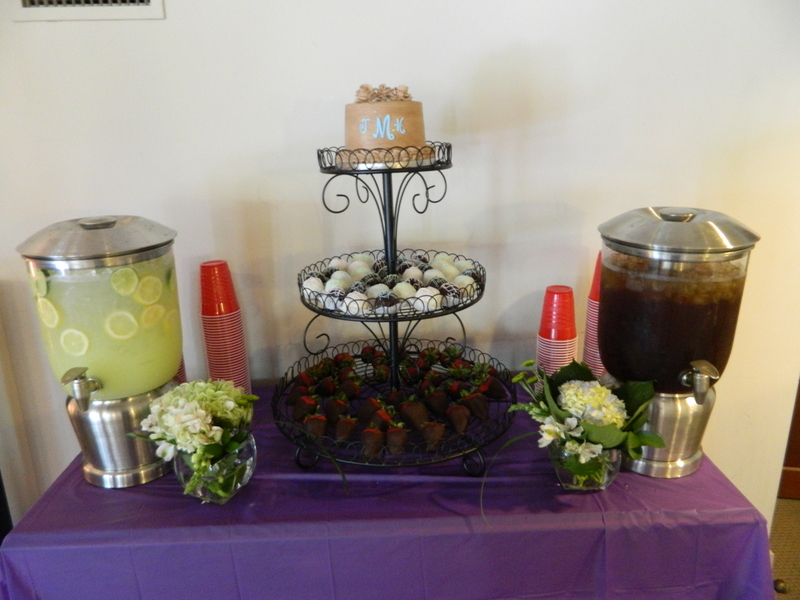 I used standing height cocktail tables for the entryway, and the cake table. 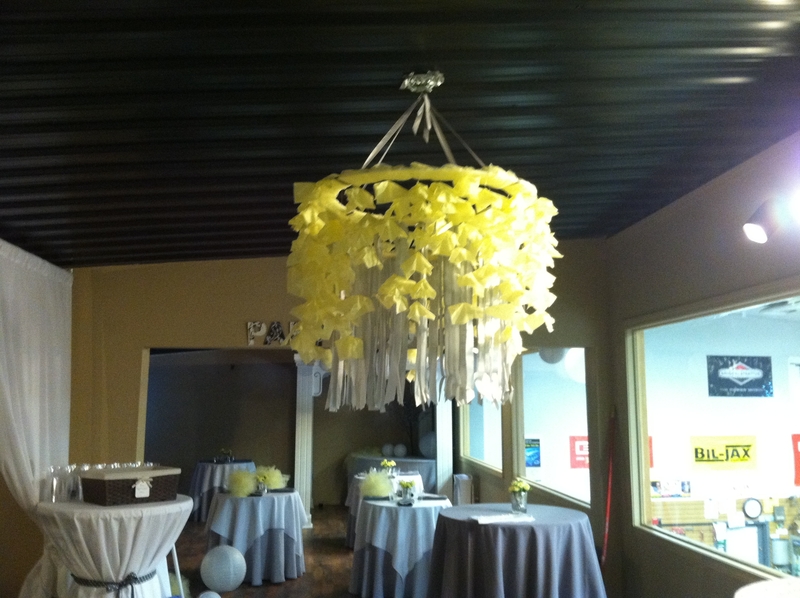 My touches of yellow, I used yellow carnations in the centerpieces, yellow on the top layer of my chandelier, and yellow tulle poms hanging from the ceiling mixed with my white paper lanterns. 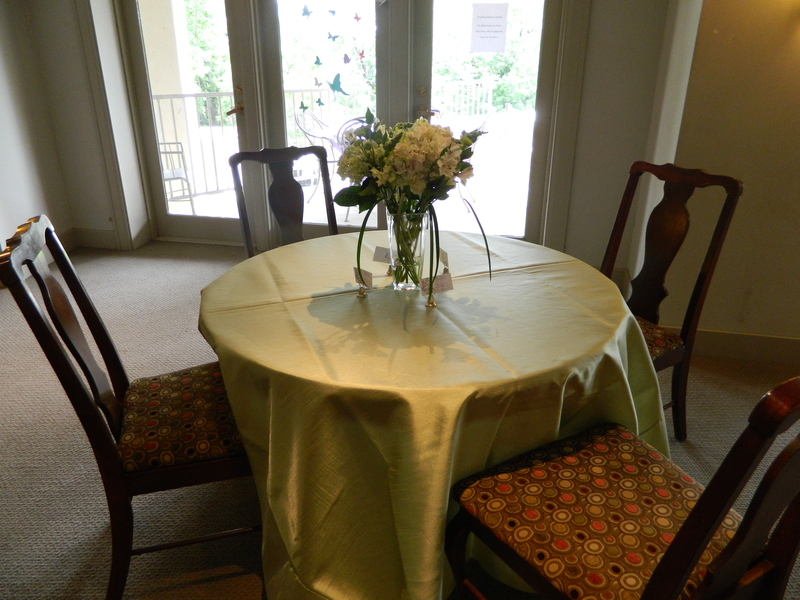 For the overall color scheme, I wanted it to feel airy despite the charcoal gray, so I used that as my base cloth, with a white overlay and pewter napkins. 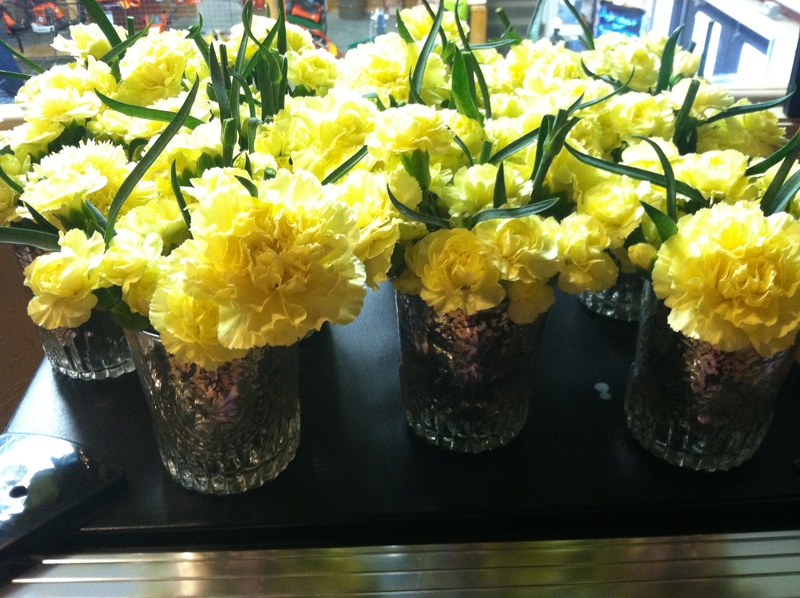 The centerpieces were mercury glass with fresh carnations and greens. 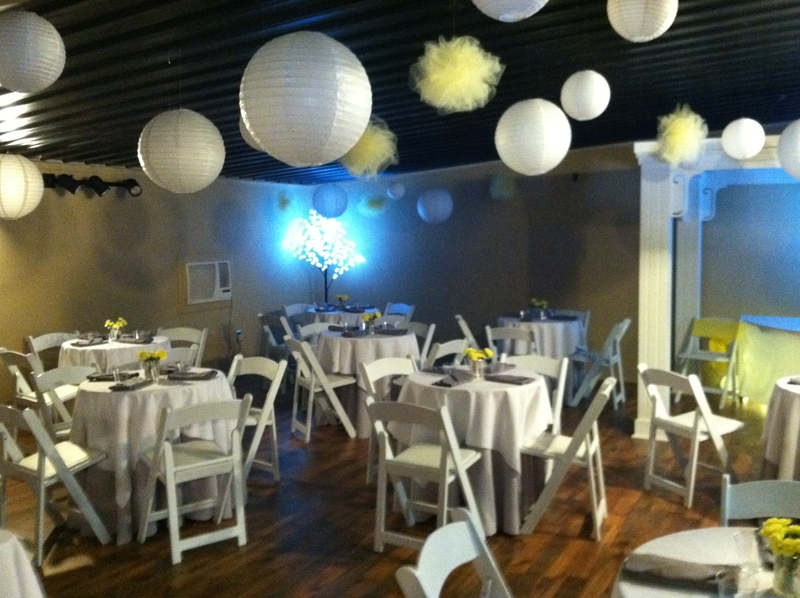 I hung white paper lanterns from the ceiling with yellow tulle poms, and had a few LED trees for ambiance. 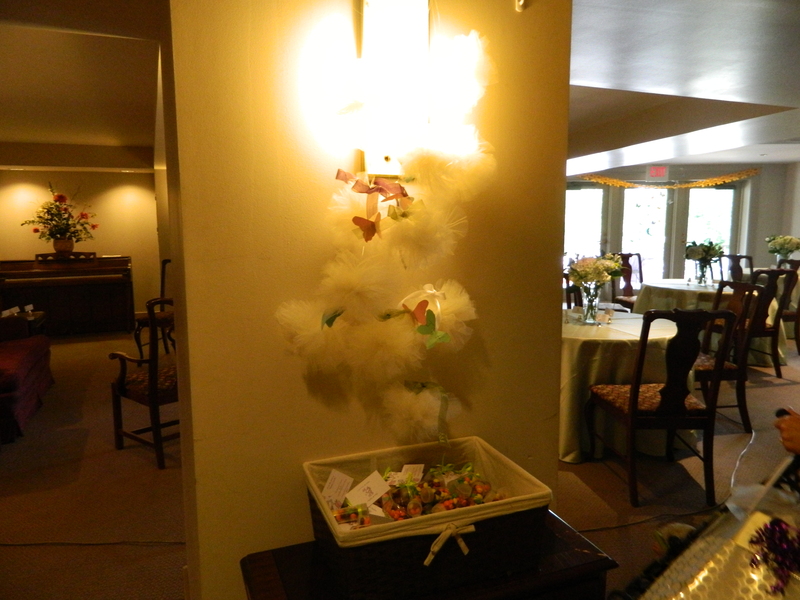 I lit the gift table from underneath, as well as the recipe basket with the wine glasses you see above. 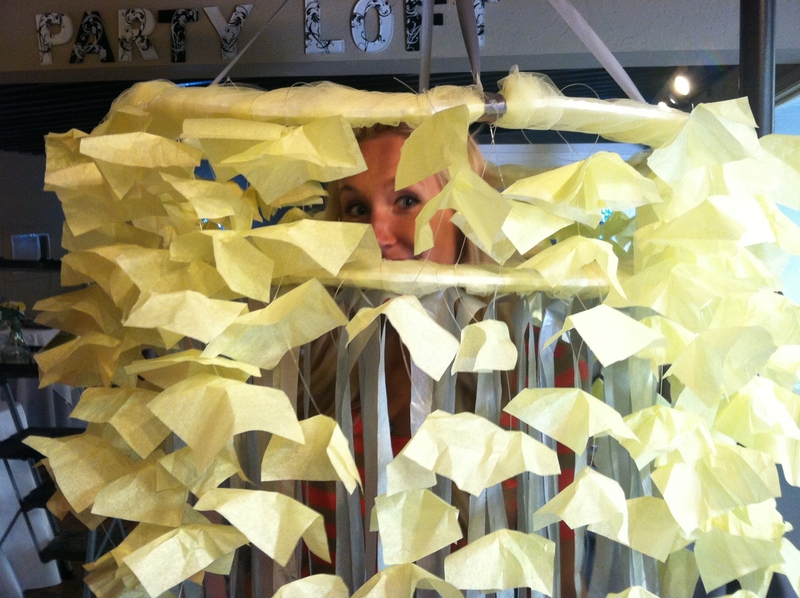 I then strung small lit lanterns and groupings of yellow tulle on top of my white serving table linens. Those elements were all difficult to see in the pictures as it was low lighting in the there to make those things be the focal points, but I’ve got some pictures below anyways. I’m sure you’re curious to see what I came up with! 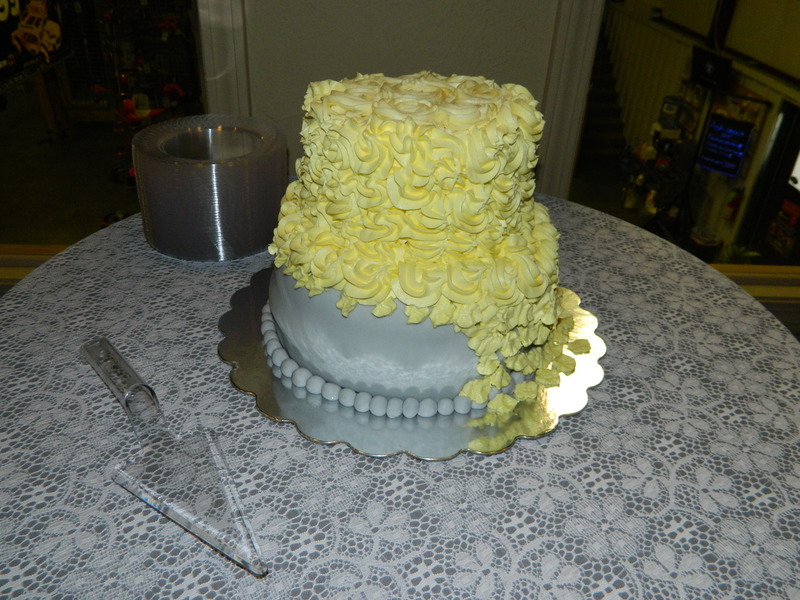 I decided on doing some sparkly gray fondant as the base, and some delicious butter cream light yellow rosettes as the top layer, which really looked cute on the girly lace overlay with the charcoal peeking through on the cake table. 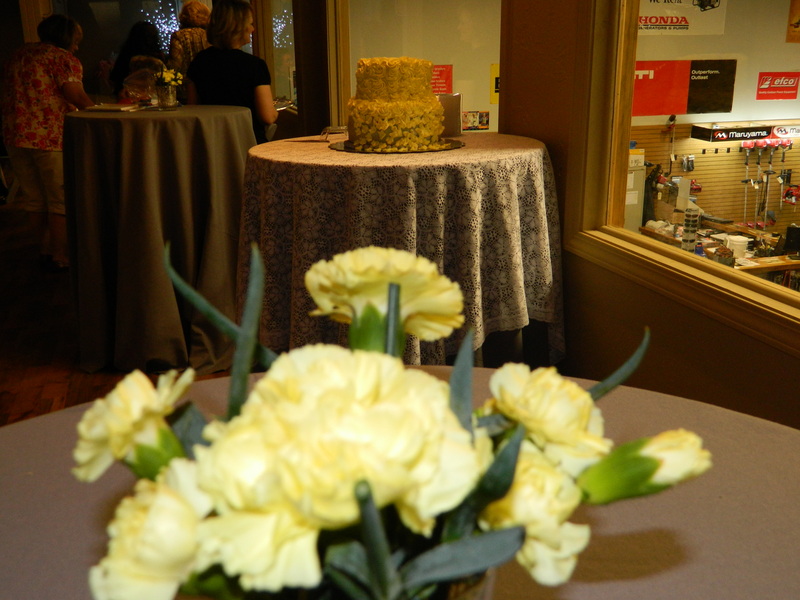 I loved the colors, so I was willing to overlook the poor fondant job, that I was sure only my trained eye would see. We had a bit of a disaster with it, though. Little did I know that was just a taste of the disaster to ensue! But I happen to have a good friend who is a baker who rushed to the rescue with her repair kit and fixed it on site when the baker, who had a bad recipe and didn’t ice the design tight enough, refused to come fix it. Thanks again, girl! Tah Dah! She really did some fancy work with only some paper towels and 3 tips on her icing bag. She even mixed that color by my description of it over the phone when she was making it at home for me! Talk about talent, it was an exact match. Enough talking! 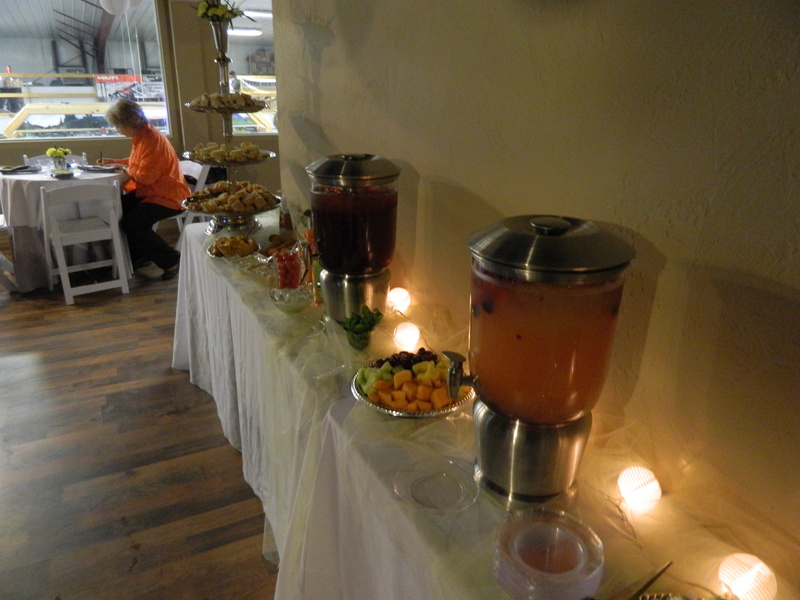 Now the final pictures, and some shots of the party being enjoyed. I was pretty excited to use this thing, we had just gotten them about 2 weeks before the shower. All in all, I was pretty happy with the turn out of the shower. So tell me about it! What do you think? What did you like? What did you dislike? If we get some good feedback from our readers, this will be a regular post. So be vocal! Share with us! So…. I didn’t exactly keep my word on keeping up with the blog since my last post in March. The summer is our busiest season at The Loft, and we have been channeling all our creativity into our brides and our ideas for them. Which now that I think about it, we should just be sharing all of that on here! So I’m going to start a new category on our blog here, just for our event ideas, and the end result of that event. I’m gathering info for it today. 🙂 Yay! If you are one of our clients and are willing to send us some great shots of our work and you and your family having a blast at your event, don’t hesitate to send them our way! We would love so much to have them.